New Delhi, September 5, 2018: Making driving safer and distraction-free, Pioneer India has launched its Smart Sync App and SPH-C19BT head unit at The Lalit Hotel, New Delhi. 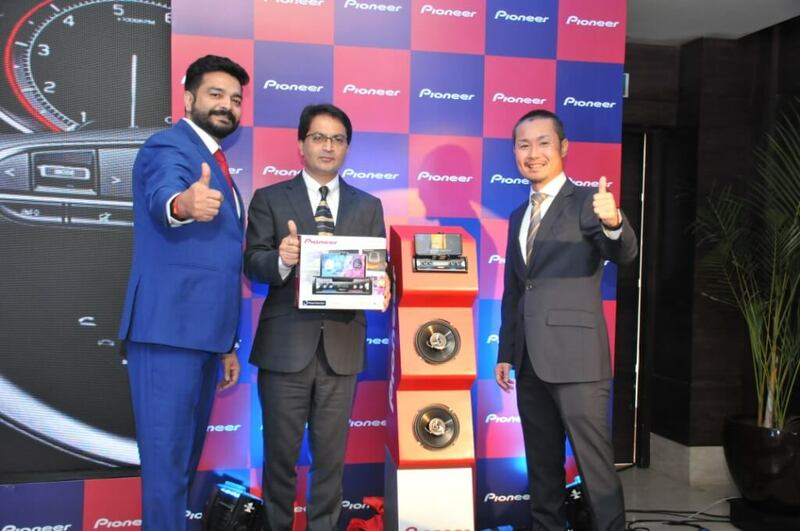 The Managing Director of Pioneer India, Mr. Toshiyuki Yoshikawa as the chief guest was given a warm welcome with many distinguished personalities and industry experts at the launch event. The unveiling of Pioneer’s SPH-C19BT mesmerized everyone with its astounding design and power-packed entertainment features. It can even be called “Mobile Amplification Device “for a common man understanding. In India, more than a lakh people die a sudden and painless death in road accidents. Where drunken driving, over speeding, and red light jumping must be blame for brutal death incidents, a distraction to drivers in the commonest of all. Seeing the rise in such accidents due to phone distractions, Pioneer’s SPH-C19BT looks a promising head unit which takes an all-around care of driver’s concerns. Be it music, call answering, message reading or google navigation, this new Pioneer product has raised our expectations quite high. Both iOS & Android Phones are easily connectable with this elegant black SPH-C19BT head unit and can be connected through Bluetooth or USB cable. It has five interactive keys assigned to perform five most-important tasks without distracting one from safe driving. A Music Key to change or stop the music, a Voice Recognition Key to give voice commands, Navigation Key to locate the destination maps, Messages Key to listen to the incoming messages, and Menu Key to open/launch the apps for setting customization. It also supports steering wheel controls, intelligent voice recognition, hands-free calling, and message read-out. Pioneer SPH-C19BT is additionally equipped with Rear Parking Sensor Input which is compatible with Pioneer Parking Sensor to give the complete read distance information to the person on driving seat and alert him/her with the beep while parking. The inbuilt cradle of SPH-C19BT firmly holds up to 87mm wide phone with a nice grip, even on bumpy rides. The audio tuning, time alignment, and other settings can be easily customized on Pioneer Smart Sync App, which is available on both Google Play and App Store. Pioneer India is the Indian Subsidiary of Pioneer Corporation, Japan. Incorporated in 2008, Pioneer India’s core business covers the car audio and video segments with a diversified range of products focusing on DVD players, home entertainment systems, speakers and car audio-visual solutions. Pioneer India, work in line with the corporate vision, to become a company that works together in ‘pursuing innovations one after another’. Pioneer India aims to continuously introduce innovative products that will raise entertainment to the level of pure emotion.